I got introduced to this dish during our stay in Hyderabad. This is a must have item in the marriage feasts in Telangana region. We liked the taste and got the recipe from our Telugu friends. The original recipe calls for sun drying the okra and then deep frying it in oil. My Telugu friends add a lot of chilli powder too. I don't have to point out this fact to the people who knows about the Telengana cuisine, it is quite tasty and SPICY :-) I have tweaked the original to fit our style. But you could try the original version , by sun drying followed by deep frying,if you wish. I wanted to take a click when I was done with the dish and went to our patio deck to capture the best light. My little one who is a "curious George", also followed me. 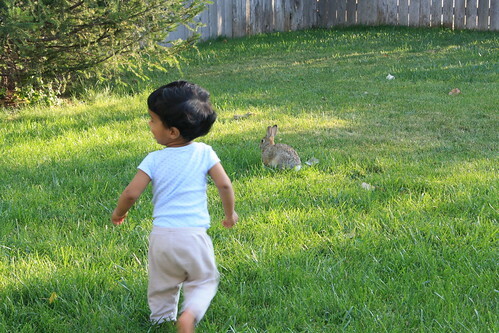 He started playing in the yard and I had to go back to get my camera.Then I heard him screaming with joy and came back running, thinking that he might be done with the fry and my bowl :-) But to my surprise I saw a wild bunny sitting next to him.The cute bunny looked very friendly and the happiness on my little guy's face was priceless. I felt close to nature and wilderness! 3.Heat oil in a pan and fry the peanuts. 4.Take out the peanuts when it is done. 5.Throw in the crushed garlic into the oil and saute it. 6.To this add chilli powder,turmeric, salt and chopped okra. 7.Mix well and cover with a lid. 8.Cook on medium heat till the okra is half cooked. 9.Take out the lid and let the okra get fried. 10.Add the fried peanuts and mix well. Nice healthy variation by adding peanuts to it!!! Okra with peanuts sounds interesting! !Never heard like this.Looks crispy and yummy. hmm i shud try this.... btw nice pic..!!! 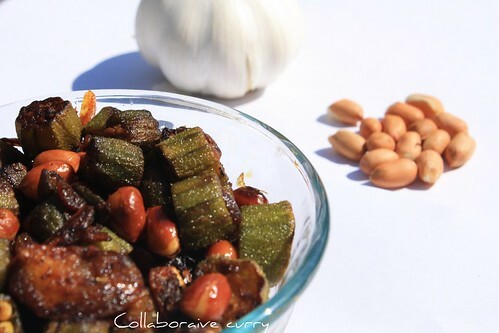 lovely pic,Interesting & a simple recipe...very nice delicious one..
Hi!Nice variation by adding whole peanuts to the Okra. My favorite dish. Nice description and photos. Nami,love the dish as well as the pic!!!!! Nice okra fry Namitha, yet the two little bunnies captured more attention!! Okra fry looks new and yummy! Love the kid click..! both the okra and milan + the bunny look wonderful. i love okra and i will defly try this one! I am game for Okra anytime!! Peanuts is the surprise element! Beautiful Click Nami!! amazing click,Adding peanuts tomokra sounds yummy.my daughter who is great fan of peanuts will love this surely. fry looks yummy....must try this one!!! Okra with peanut...must try..and your kid looks so excited!Fun age!! Thanks for all the lovely comments and compliments.. I am a little late in posting my comments. Yesterday when I saw the recipe and picture, it was so mouthwatering that I wanted to try it right away. So I made the fry today with a little bit of 'my own modifications' :P . I have added some onion to saute and some fried cashews too. wow..such a lovely blog...u have a cute name too...looks delicious! 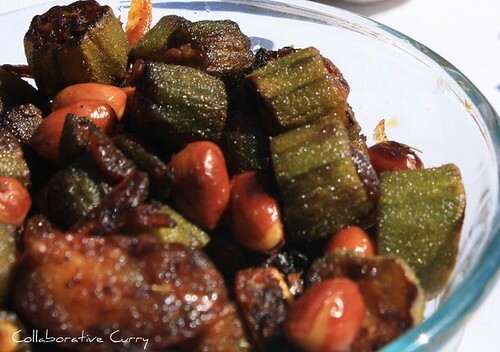 never eaten okra using this recipe..it sounds awesome..
@Nits :Thanks a ton. That's a big encouragement..
@Kitchen flavors : Pl try out and let me know..